In the Middle Minoan period the pictorial symbols employed on seals, and called hieroglyphic after the early Egyptian script, were systematized to form a regular script. 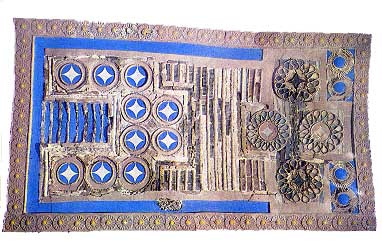 This developed at the end of the period and in the Late Minoan I into a system known as Minoan Linear A, in which pictorial elements are reduced to outline patterns. More than 100 signs were in use, without counting the frequent ligatures of two signs. They occur mainly in groups separated by small strokes. 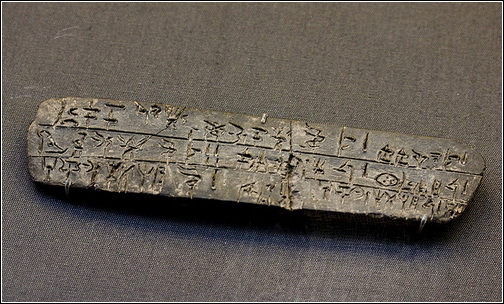 In view of their number and evident connection with the Linear B script of the Mycenaean civilization, it can be inferred that most signs had the values of simple syllables, usually consonant plus vowel. Other signs represented the people, animals, and commodities listed on the documents, and these signs are frequently accompanied by numerals, which have a simple notation on a base of 10. The signs are written horizontally from left to right. The documents are of two classes. Most are clay tablets, which were inscribed with a sharp stylus while the clay was still wet, and then sun-dried. These were used to keep day-to-day accounts, and no tablets so far known appear to contain continuous texts. Other objects—mainly of a religious nature, such as offering-tables—were sometimes inscribed. Here the signs were engraved on stone or metal. These texts appear to be dedicatory, and repeating groups found in them may be the names of deities. Since the majority of the signs have close parallels in the Linear B script, their phonetic values are likely to be similar. But though the meaning of a few words can be deduced from their use, the underlying language has proved impossible to identify. Some scholars regard the language as of Semitic type, others as Anatolian, a branch of Indo-European. But no consistent pattern has emerged, and these claims must be treated as premature. However, it can confidently be asserted that the language is not Greek. The Phaistos Disk, from a Middle Minoan context, is a unique example of an otherwise unknown script. Each sign was impressed from a separate stamp. It is possible that the disk was imported into Crete.